William George Orchard's next ship was a very different vessel to the Daphne. 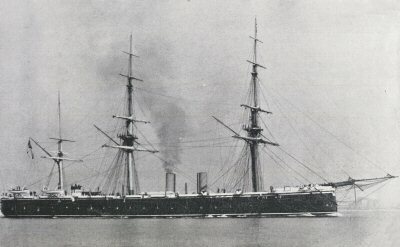 HMS Achilles was one of the 'dull iron-clads' so disliked by the reporter of the Chronicle. There is some discrepancy in the records over the date on which AB Orchard actually joined the ship. According to his Continuous Service record, he began service with her on 25th May 1870, the day after the Daphne signed off her crew. However, the entry in the ship's Muster Book indicates that he transferred to HMS Duke of Wellington. The Victualling List of Achilles covering the period from 1st July 1870 to 30 July 1871 shows that, although Geo. Orchard 'entered' the ship on 25th May 1870, he did not actually 'appear' until 12th August. This means that he was borne on the ship's books from the former date and paid as a member of the crew. He was not physically on board the ship, however, actually being victualled by her, until the latter date. In addition, a Description Book for Achilles has survived, and this supports the above evidence. Captains were required to keep books containing a physical description of every man on board (particularly useful if someone deserted), but they were not required to return them, and so few are preserved. Fortunately, the vital one for Achilles has survived. As well as providing an up-to-date description of George Orchard (5ft 5ins tall, sallow complexion, hazel eyes, brown hair) it also includes a summary of his service record to date. Amongst other things, it records that George Orchard was "Entitled to a share in all slave dhows &c captured by 'Daphne' between 2nd Aug 67 and 24 May 70". It also notes that he arrived on the Achilles on 12th August 1870, having been attached to HMS Duke of Wellington since 25th May. Achilles was, in 1870, one of the Navy's newest and most up-to-date ships, having been built seven years earlier, at Chatham Dockyard, and launched on 23rd December 1863. She was a modification of HMS Warrior , the Navy's first major armoured warship to be built wholly of iron, and now preserved at Portsmouth. Achilles was originally designed to almost the same plan as Warrior , but a lack of protection to the steering gear had been noticed in the earlier vessel, and this was rectified, raising the weight of the new ship from 6710 tons to 9280 tons. The armour belt was extended for the whole length of the waterline and the guns placed behind armour. 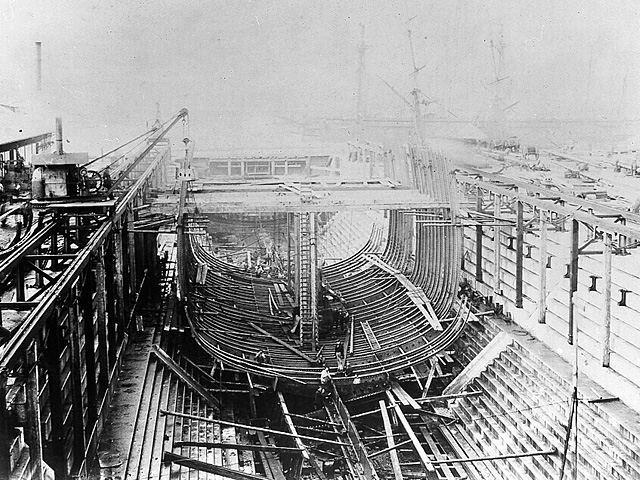 In addition more powerful engines were fitted, but the vessel still carried sail, and the sail area when completed was the largest ever set in a warship. The design proved so succesful that three similar vessels, Agincourt, Minotaur and Northumberland were built to the same formula. At this time Britain was moving through a relatively peaceful period in her history, and ships of the line saw little action, and this is reflected in the Log of the Achilles for the time in which George Orchard served on her. Assuming he joined the ship on 12th August, this was when she was in Portsmouth for a time, having arrived on the previous day. After just over a month in Spithead the ship returned to Portland on 21st September, where she stayed until 2nd June 1871. During this time the Ship's Log reports only routine, but some notable events occurred in George Orchard's life. On 16th February he was promoted to Able Seaman. A week later some mishap befell him, either an injury or illness (later records indicate an injury) as the ship's Victualling List mentioned above contains an entry in the Muster Columns which reads 'S.S. 24 Feb'71 Haslar'. 'S.S' indicates that a man had been 'sent ashore sick', although only for a short time and was still entered on the ship's books for victualling and muster purposes. The muster for the next quarter indicates that he was still in Haslar in April, but had returned to the ship by 3rd May. On both 21st and 24th May he was 'On leave'. This entry links in with information from civil rather than naval sources, as on 22nd May George Orchard married. His parents had by now moved to Weymouth, and were living in Silver Street. In the Census taken on Sunday 2nd April 1871 John and his wife Mary were in the house with William's brothers, 17-year-old Joseph and 9-year-old Francis, and his sister Ann, aged 11. Also in residence, officially listed as a visitor, was Sarah Read, a house maid, born in London, aged 22. Sarah was to be George's bride a few weeks later, the marriage taking place at the local church of Holy Trinity. On the marriage certificate, Sarah gave her age as 22, and her father's name as John Read. In fact, her birth certificate shows that she was 26, and her father was John Miller, her mother being Maria Read. She had been born in Bethnal Green on 28th January 1845. The Census on the night of Sunday 2nd April confirms that AB Orchard was still in hospital at Haslar. The Census return for HMS Achilles has been filled out to show men NOT on board, and George Orchard, Ordinary seaman, age 21, born Preston, Dorset, is on this list. Life back on Achilles continued to follow normal routine for the rest of the year, except for an excursion to Plymouth between 2nd June and 9th July, the remainder of 1871 being spent at Portland. George Orchard's Continuous Service Record does show one break in routine in that it notes that on 14th December he attended a Naval Gunners course. 1872 carried on where 1871 left off, with Achilles in Portland Harbour. Things were to take an unfortunate turn later in the year, however. On 23rd May the ship left Portland and returned to Devonport, this time for a longer stay. Five days later she was alongside the docks at Keyham Basin, and on 6th June the task of dry-docking the ship began. She stayed in dock until 24th July when, with the assistance of tugs she was taken out to sea and the engines tried out, returning to Plymouth Sound later that day. The refit complete, Achilles returned to Portland on 27th July, and anchored in the Harbour. Two days later, on Monday, 29th July 1872, she took part in an historical event. 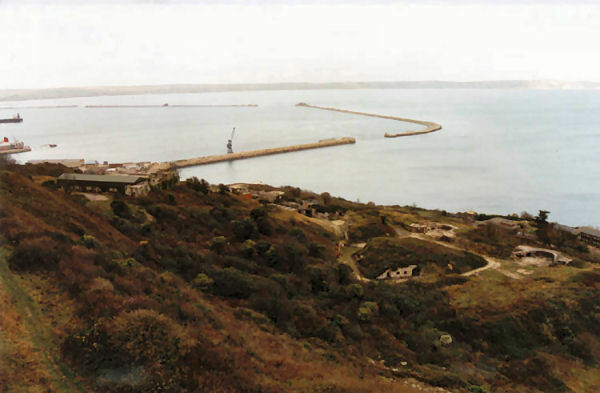 For several years a breakwater had been under construction across the entrance to Portland Harbour, and it was now complete. The Channel and Reserve Squadrons assembled in the harbour, and the Prince of Wales arrived aboard the Victoria and Albert to a no doubt thunderous royal salute from the ships' guns. Amongst the ships gathered to watch the Prince lay the last stone were fifteen battleships, including Achilles and her sister ships Minotaur and Agincourt. "Tuesday 30th July 1872 at Portland. Read the following Warrants: Alan Martin, Musician, to be reduced to Bandsman and 2nd Class for conduct. Go. Orchard AB, V Cornelius Smith AB, and Jas. Orley AB, for confinement in Lewis Gaol for 42 days and reduced to 2nd Class. "John Philips AB, to be confined in cells on board for 10 days and reduced to 2nd Class." "Wednesday 31st July 1872. Sent Go. Orchard AB, Jas. Orley AB and Cornelius Smith AB, to Lewis Gaol for 42 days." Unfortunately this meant that George was not present at the baptism of his first child, daughter Ada Georgina, at Holy Trinity church on 1st August. Whilst he was absent from his ship, he also missed a further expedition away from Portland, this time into the North Sea, visiting Yarmouth on 28th August and the Nore, at the mouth of the Thames, on 31st August, returning to Plymouth on 2nd September and Portland on 7th. The Log records that at 8.40 pm on 12th September HMS Salamander came alongside with prisoners being returned from gaol. The Salamander 's own Log shows that at 8.00a.m. on 12th September 1871, at Portsmouth, she 'Embarked Officers and Seamen for passage to Channel Squadron at Portland'. The ship cast off from the hulk to which it had been moored at 9.30a.m. and steamed out of harbour 20 minutes later. After an uneventful trip she rounded Portland Breakwater at 8.15p.m., shackling onto a buoy in the Roads a quarter of an hour later, when supernumery officers and seamen were discharged. No further events of note occurred that year, Achilles remaining at Portland until, in fact, well into 1873. In 1873, the Royal Navy simplified the records of men serving on Continuous Service, and the new entry for William George Orchard shows that he was now 5ft 5ins tall, and had a scar on his left arm. Eyes and hair were entered as the same colour, and his complexion was described as fair. He had no recognised trade, and wore no Good Conduct medals. 1873 again saw Achilles mainly moored at Portland, although two excursions were made. She left Portland at 12.45 pm on 28th May, arriving at Spithead at 4.50 am the next day. She remained there until 6th July, when she moved to Plymouth. Three weeks were spent in Devonport Dock, the ship returning to Portland via Torbay on 6th August. After only a few days the ship was on the move for her 1873 'Summer Cruise', as on 16th August she was off the south coast of Ireland. After a couple of weeks in the area, a stop was made at Plymouth Sound again, with a return to Portland on 13th September, where the ship was to remain for the rest of the year. The Quarterly Ledger of HMS Achilles for the period 1st July to 31st December 1873 gives an idea of how much a seaman was paid. For the period 1st July to 30th August AB George Orchard received full pay and allowances for 92 days at 1s 7d per day. From the total pay due, in July he was given 8s 0d, in August 18s 8d and in September 14s 0d. From the remainder was deducted £4 10s for 'Tuition of young gentlemen' and £1 8s 8d to cover clothing issued. At the end of September this left a Net Sum Due of £1 4s, which was transferred as a credit to the next quarterly account. Early in 1874, on 8th January, HMS Achilles and her crew left Portland, bound once again for Plymouth. On 12th January she was moored in the Hamoaze River, and three days later she moved to Keyham Yard and then Keyham Basin. The final entry in the Ship's Log was made on 12th February 1874, and notes that the ship was being laid up and the crew were turned over to HMS Royal Albert. With that entry, George Orchard's service on a modern battleship came to an end, a service which should have been interesting, but which, if the daily Log Book entries are any indication, was in fact a very dull and routine three years service. The Achilles remained in service with the Navy for several years. Made obsolete as a battleship by improvements in steam power and the advent of the dreadnoughts, she was converted to a base ship and renamed Hibernia in 1902. Further name changes took place, Egmontin 1904, Egremontin 1918 and finally Pembroke in 1919. She was finally sold on 26th January 1923.